Dr. Keith is a graduate of St. Louis University School of Medicine. He did residency training at New England Deaconess Hospital and completed a fellowship in Vascular Surgery at the University of Massachusetts Medical Center, and is board certified in General Surgery and Vascular Surgery. He is a past member of the Medical Executive Committee and past chairman of the Department of Surgery at St. Luke’s Hospital. 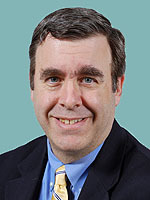 A member of the American College of Surgeons, Massachusetts Medical Society, and New England Society of Vascular Surgery, Dr. Keith has practiced in New Bedford since 1992.